In my house we LOVE pasta. I mean love it. We love wheat pasta in every shape and size. Macaroni and cheese? YES PLEASE! 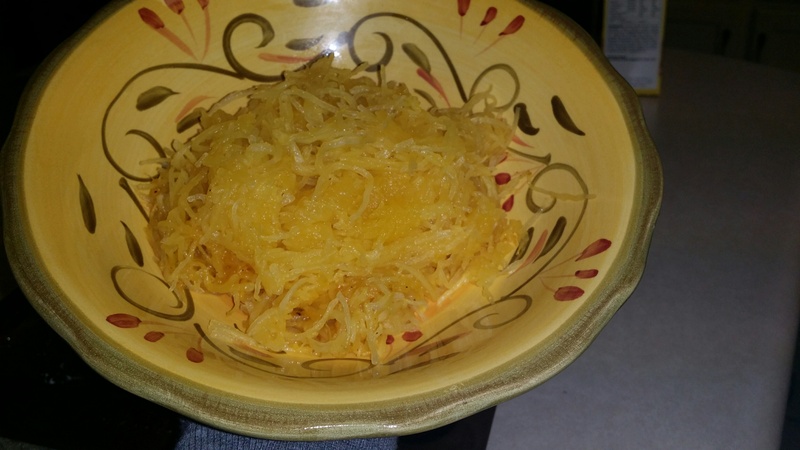 So imagine my surprise when I found out about spaghetti squash. Now maybe I’ve been living with my head in the dirt, but I can honestly say even though I’d heard of it, I would have NEVER thought we’d like it. I mean squash? Little did I know…. We’re fortunate to get some really cool items from our CSA (See more about River Creek Farm) every month. From arugula to okra, we’ve tried it all. And then, there was squash. Now I’ve always thought of squash as fall decor. You place the little ones on tables, and larger ones on the porch. I’m hear to tell ya..take them squashes off that front porch young’uns! They are GOOOOOD! This recipe couldn’t be any easier to make! Here are the ingredients: Squash. Seriously, super easy. 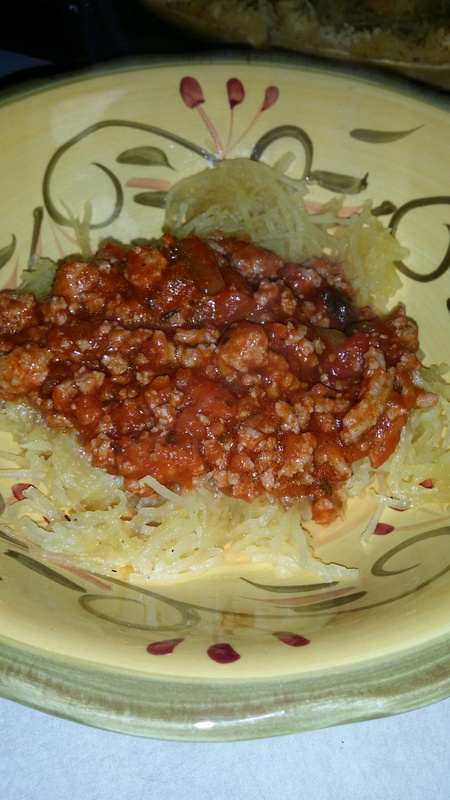 I made mine with a red sauce (and ground turkey) and topped it with Parmesan cheese. Rave reviews..even from the baby. Next comes the fun part, cut the squash into. I personally am a weakling, so I let my strapping hubby slice and dice on this recipe. Place the halves with the flesh side up, drizzle with Olive Oil, salt and pepper. Now roast that sucka for about an hour. I made my sauce in the time the squash was in the oven. After an hour, take the squash out and let it rest for a couple of minutes so it’ll cool a bit. Now for the fun part! SHRED it! 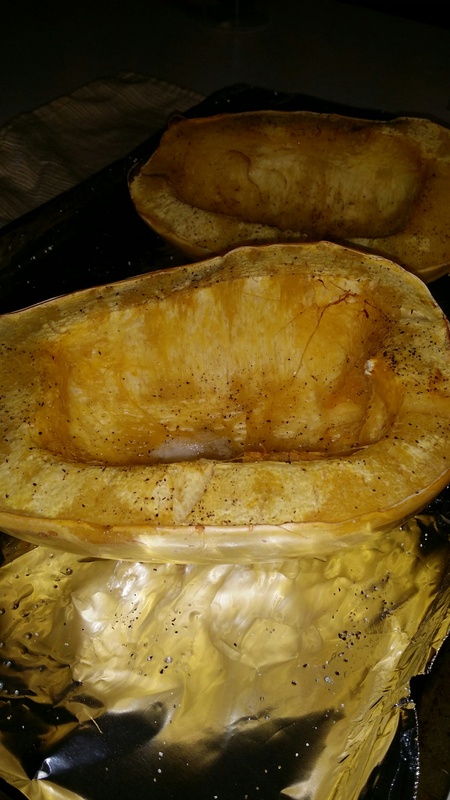 Just rake a fork across the cooked squash..it’s so easy. It LOOKS just like pasta! I love the mild flavor, but if you like you can toss it in a little butter or even olive oil. It almost has an al dente quality, which I personally love. Top with your favorite sauce and enjoy! I think my favorite part about using this squash is that you don’t have to worry with a ton of pots, boiling, and then worrying about over or under cooked pasta. It’s always perfect..every. single. time. Another wonderful thing about fall, squash! There are so many reason to love this time of year..and I get to enjoy them in My Tennessee Kitchen!